A perfectly balanced and evenly looped bow is not the challenge you are thinking it will be. These free step by step directions will guide you through the process so you can decorate clothing, gifts and more with perfect bows. 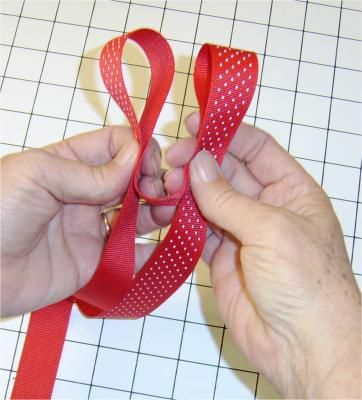 Use a length of ribbon which will be long enough for the bow you want to create. Find the center of the length of ribbon. Create a loop on both sides of the center of the ribbon. Cross the loops over each other to create an X. Tie the bow by bringing the back loop forward through the opening under the X. Twist the center and tails so the right side of the ribbon is exposed. Pull ribbon loops to tighten bow. Pull the tails to shorten the loops and repeat tightening the bow if desired to adjust the size of the bow.